Wilde was speaking of Shakespeare, who, in Wilde’s view, revealed more of himself in his plays than he did in his sonnets. Over the years I have often recalled Wilde’s maxim, and I have had occasion to test it against my experience, both as a teacher of imaginative writing and as the author of poems, essays, and a verse novella. And by and large I have found Wilde’s notion to be true, though perhaps not in the way he intended. During my tenure as Professor of English at Alfred University, I taught an advanced writing course called Dramatis Personae. In this course each student created a character—a mask, if you like—and wrote from that character’s’ vantage point throughout the semester. The first assignment was a dramatic monologue; subsequent assignments included familiar letters, diary-entries, and first-person narratives. By mid-semester, if there were fifteen students in the room, there were also fifteen characters, and toward the end of the course the students artfully combined their characters in scenes and stories. The final assignment was a valediction, in which the students bid farewell to the characters they had inhabited for the past three months. As might be expected, Dramatis Personae drew students interested in theater and psychology as well as imaginative writing. With few exceptions, they took to the work with gusto, crossing boundaries of gender, age, and ethnic background. Among their more memorable creations were a concert pianist who placed a marble bust of his mother on the piano during his concerts; a nineteenth-century American Indian maiden; a feisty, teen-aged boy from the inner city; a seasoned, outspoken journalist with reactionary social views; and a harried suburban woman modeled after the author’s mother. Perhaps out of deference, no one ventured to create an English professor, though one did create a venerable tree and managed to write from that standpoint. To a contemporary reader, Dramatis Personae might sound like an early version of Second Life. But in spirit and purpose the course differed fundamentally from that online phenomenon, insofar as the intent of Second Life is to project one’s present self into an “avatar” and live a life more exciting than one’s own. For if Dramatis Personae served, in part, as a training ground for potential poets, playwrights, and novelists, it also provided a setting in which to cultivate—and often to demonstrate—imaginative empathy. Rather than foster self-concern, the course encouraged self-forgetfulness. Rather than promote the making of fantasies, it sponsored a difficult realism—that of seeing others as persons in their own right, rather than as figures in one’s private psychodramas. A certain loss and a less-than-certain gain. Thus began a blank-verse monologue of some nine hundred lines, later entitled “The Word from Dublin, 1944.” Over the next two and a half years, this monologue would be followed by five more of similar length, in which my unnamed lexicographer meditates on Irish history, his “bungled” personal life, and his violent century, exploring such themes as loss, dispossession, and reconciliation. In time, this sequence of monologues would become my book Midcentury,** which is at once a verse novella and a book-length meditation. Apart from its integrated themes, what holds that book together is its “mask”—a narrator whom the Irish poet Patrick Chapman, in his review of Midcentury, likened to an Irish storyteller and described as “a man of our own time, slightly at odds with the ways of the world but human and recognizably one of us.” And yet that all-too-human storyteller never lived. From first to last, he was a persona, a fictive presence whose voice and vision gave coherence to otherwise disparate events. Drama and meditation are sometimes viewed as opposites, the one centered in conflict and catharsis, the other in the cultivation of inner peace. But the practices of dramatic writing and Zen meditation share a common objective, namely the study of the nature of the self. And what both practices can reveal is the extent to which that fabled entity is a fabrication, be it a character in a novel or the personal “self” we construct and re-construct from day to day. Having fabricated a fictive self, we are in a position to see how the mind can fashion a seemingly solid character out of thin air. And by practicing Zen meditation, we can come to see how we make characters of ourselves, constructing illusory, separate “selves” from the stream of discrete experiences and the dynamic web of life. That may or may not have been the truth that Oscar Wilde had in mind, but it is one of the most important fruits of meditative practice. * Oscar Wilde, The Critic as Artist: With Some Remarks Upon the Importance of Doing Nothing and Discussing Everything. 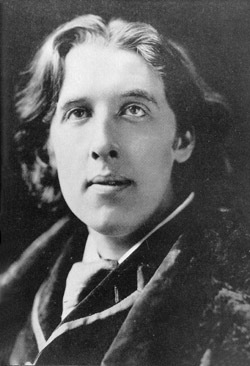 See http://www.online-literature.com/wilde/1305/?term=man+is+least+himself. ** Ben Howard, Midcentury (Salmon Poetry, 1997). Patrick Chapman’s review may be read at http://salmonpoetry.com/details.php?ID=126&a=6. Very nice to discover your blog! Thanks for getting in touch.